Autofac 2.4 is just around the corner, with beta builds now available via the project site (the short list of changes since 2.3 is available here.) One of the enhancements coming with this release is improved support for wiring up components in the Decorator Pattern. Circa Autofac 2.2 we introduced container support for the Adapter Pattern. An Adapter takes a service and exposes its functionality through a different interface. While it has always been possible to implement adapters in Autofac using the basic APIs, adding container support for “bottom-up” composition makes it easier to implement adaptation reliably on all implementations of an adapted service. Decorators are a similar story. Given an implementation of a service, a decorator takes that implementation and modifies its functionality, exposing the same interface. 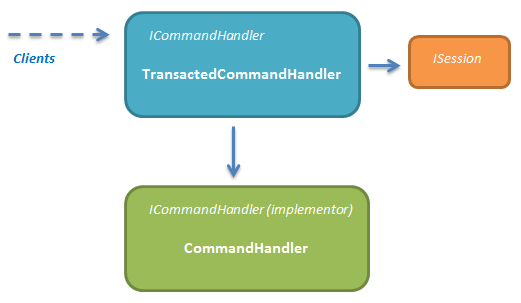 Here the TransactedCommandHandler is a decorator for the ICommandHandler service, that adds transaction management via a persistence session. The CommandHandler component provides the actual implementation of the service. Clean and straightforward – and recommended if your scenario is as simple as the one above. If you have more than one component that you’d like decorated, or want to use decorators with open generics, then things can get more complicated rather quickly. Drawing on a lot of inspiration from the design philosophy of MEF, Autofac has good support for handling n things like this. In 2.4, we use that support to automate some of the process of configuring decorators. IoC Design Tip: When you’re looking for abstractions to use as services in an application, prefer those that describe a set of related things. Zero-or-more type relationships are less brittle in the face of change than exactly one or zero-or-one relationships. There are two new registration methods for decorators in Autofac 2.4 – a non-generic and a generic version. The first thing you’re probably thinking is “hey, this isn’t any less code than the old way!” That’s very likely true, but reducing the amount of code involved wasn’t a goal here. The difference between this code, using RegisterDecorator and the first example is that this version decorates all implementations of ICommandHandler, so if additional command handlers are registered (using the “implementor” name) then they will each get their own decorator. There are some diagrams in the adapter article previously linked that describe the object graph structure; reading that article will shed some light on what I’m talking about here if the details are a bit foggy. The generic parameter (here ICommandHandler) is the service that is being decorated. The method accepts a delegate that, given the context c and the implementation of the service being decorated inner, produces an instance of the decorator. The final pair of parameters are fromKey and toKey (optional) that describe where this decorator sits in the chain from implementation up to the topmost decorator. This works the same way as in the decoration-by-hand example earlier. The generic decorator will be applied to each concrete implementation as expected. There are other ways of implementing decorator support and different choices that can be made about how the APIs should work. There are certainly some big trade-offs made in this implementation; in most of them, simplicity and orthogonality trumped concision or ‘magic.’ A discussion of these decisions almost made it into this article, but I worried about this obscuring the more useful and concrete content. If you have any questions about why things are done this way please do post a comment!